JCSIS is committed to maintaining the highest ethical standards for all parties involved in the act of publishing in a peer-reviewed journal: the author, the editor of the journal, the peer reviewer and the publisher. Council. Ethical guidelines for peer reviewers (September 2017) and A Short Guide to Ethical Editing for New Editors (January 2016). Authors who are concerned about the editorial process may refer their concerns to COPE. Editors of JCSIS will guard the integrity of the published record by issuing corrections and retractions when needed and pursuing suspected or alleged research and publication misconduct. Editors should pursue reviewer and editorial misconduct. An editor should take reasonably responsive measures when ethical complaints have been presented concerning a submitted manuscript or published paper, in conjunction with the publisher (or society). Such measures will generally include contacting the author of the manuscript or paper and giving due consideration of the respective complaint or claims made, but may also include further communications to the relevant institutions and research bodies, and if the complaint is upheld, the publication of a correction, retraction, expression of concern, or other note, as may be relevant. Every reported act of unethical publishing behavior must be looked into, even if it is discovered years after publication. JCSIS Editorial Board members oversee the peer review process for the journal, including evaluating submissions, selecting reviewers and assessing their comments, and making editorial decisions. Together with Advisory Editorial Board Members they are involved in the development of journal policies and ethics standards and work to promote the JCSIS mission to provide resources, support and advice for early stage researchers in their journey from writing to publishing their scientific papers while at the same time making free public access to scientific research. Authors should sign and adhere to publication requirements that submitted work is original, is not plagiarized, and has not been published elsewhere. Fraudulent or knowingly inaccurate statements constitute unethical behavior and are unacceptable. If the authors have used the work and/or words of others, that this has been appropriately cited or quoted and accurately reflects individuals' contributions to the work and its reporting. 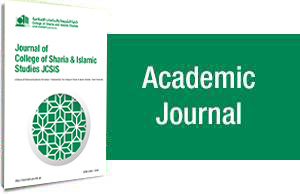 JCSIS reserves the right to reject papers the Editors believe have been plagiarised from other sources, including the author’s own previous work. In case of plagiarism, misuse of published articles, and/or illegal distribution of research papers are proven, JCSIS is very aggressive in the legal actions it takes so as to prevent such unethical action. An author should not Generally publish manuscripts describing essentially the same research in more than one journal or primary publication. Submitting the same manuscript to more than one journal concurrently constitutes unethical publishing behavior and is unacceptable. 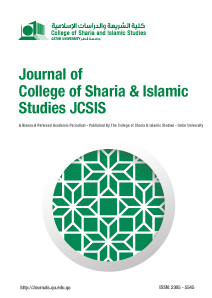 The College of Sharia and Islamic Studies, Qatar University, as the publisher of JCSIS, encourages the editors to follow the COPE Code of Conduct for the Editors. Publisher provides reasonable practical support to editors so that they can follow the COPE Code of Conduct for Journal. Publisher defines the relationship between publisher, editor and other parties in a contract, respect privacy (for example, for research participants, for authors, for peer reviewers), protects intellectual property and copyright, and fosters editorial independence. *** and publish content on a timely basis.